Cable/satellite television channel SyFy recently ran the four-hour mini-series Alice, which is a re-imagining of the classic Lewis Carroll book Alice’s Adventures in Wonderland and its sequel Through the Looking-Glass. The same production company also released the six-hour mini-series Tin Man in late 2007, which as you may have guessed is a re-imagining of L. Frank Baum’s The Wonderful Wizard of Oz. 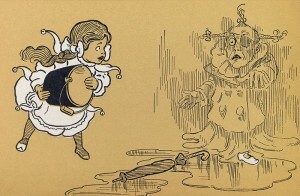 Both of these are wholly re-imagined, in that although they retain the familiar characters and the name of the place in which the stories occur (though Oz is referred to as the O.Z. or Outer Zone), the events and much about the characters is brand new (the March Hare is especially reworked). I watched each with a bit of skepticism, but found them both to be interesting enough to warrant not only watching to the end, but to reflect on what made them work post-viewing. The overarching themes of both stories (the originals, that is), of a contemporary hero figure that is thrust into a world very different from her own, where she learns that not everything is as it seems and through realizations of her own strengths and weaknesses is able to overcome significant odds, prevail and grow, are retained. This is necessary since otherwise the stories would feel out of sorts to those familiar with them. By stripping the stories down to this level and then building them back up with new visions of these fantastic worlds, the writers (yes, the tales are full of great visuals, but I for one am not often wowed by gimmickry without substance) did not lose their audience. I’m not sure why, but I had not previously considered these stories together. That they both feature strong central female characters (both heroes and villains, mind you) and that they both offer multiple levels of appreciation should have been enough for me to draw them together at some point; but it just never happened until the television re-imaginings forced the consideration. For me at least, not much on television these days rises to the level of a classic. However, these two are worth checking out if you’re a fan of either of the originals.